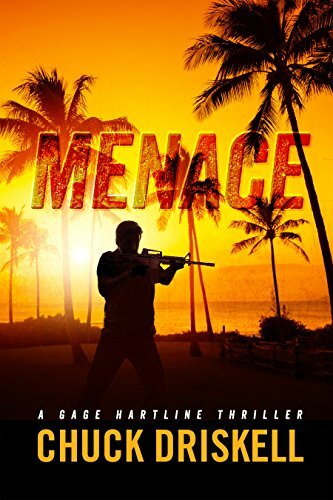 Weary of violent missions, Gage Hartline is tempted by a basic job on a family-owned island off the coast of Honduras. All he has to do is whip the family’s small security force into shape. The pay is good. The work is simple. What could possibly go wrong? The job interview, for a start. After a fiery personality clash with his potential boss, Gage declines the job. But before he can leave the island, he makes a revolting discovery. In a matter of minutes, Gage finds himself marooned on the island, defending himself against a security force of 40 men. There are precious few allies on the island, and miles of ocean all around. Gage must use every trick he’s ever learned to survive—but even Gage has a limit. He can only hold out so long. Combining crime, suspense, thrills and romance—with an indulgent helping of highly-flawed Driskell characters—Menace is a thriller that delivers on action and keeps readers guessing all the way until the explosive climax.